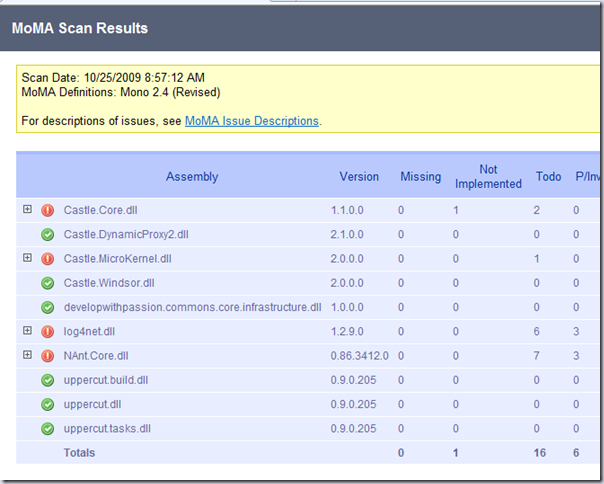 If you are using UppercuT, you will be pleased to know that it now supports Mono Migration Analyzer (MoMA for short). All you have to do is upgrade. And with the design of UppercuT, we’ve made it super simple to upgrade. How hard is it to upgrade UppercuT? Just drop in the files in your build folder, check for changes to the lib folder (especially in the NAnt directory) and new folders, and then check for any changes to the .bat files and UppercuT.config and you’re done. Here is what the report looks like running against UppercuT. It looks like UppercuT is okay to run on *nix, but a few of it’s dependencies may have some issues. 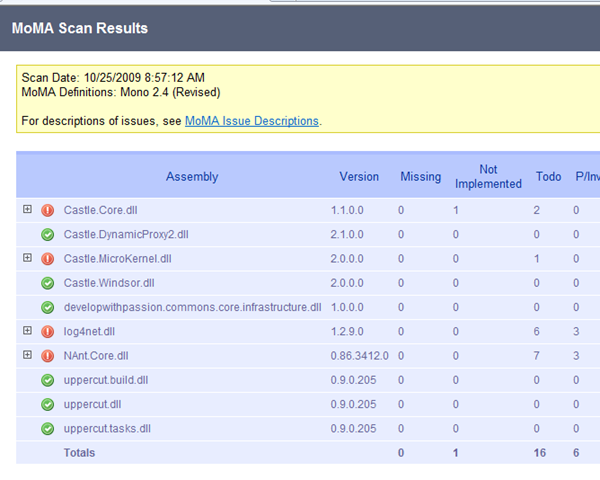 If you look closer, you can find whether the method is not implemented, on the TODO list, or the P/Invoke list. The P/Invoke’s will only work if your OS has implemented them. Yet another reason to use UppercuT. The builds just keep getting better!